Our English alphabet evolved from the alphabet used in ancient Rome. Old Latin did not have a letter "J". In keeping with that tradition, the printer did not use "J's" when they were the first letter of a word. He used "I's" instead. This makes such strange-looking words as "Iewrie" ("Jewry" -- like the Jewish nation) in verse 17, "Iohn" ("John") in verses 18, 19 and 24, and "iustified" ("justified") in verse 29. What's a dictionary? It would be a long time before any type of standardized spelling would be developed. So words were spelled like they sounded. Don't let all those extra "E's" confuse you in words like "passe" (pass -- Verse 11), "poore" (poor -- Verse 23), and "winde" (wind -- Verse 24). And the spelling of "al" (all), "countrie" (country) and "citie" (city) were perfectly acceptable at the time. The verse numbers in this edition were placed beside the text, in the inner margin (the one closest to the binding). Thus their position alternates -- left, then right -- on adjacent pages. 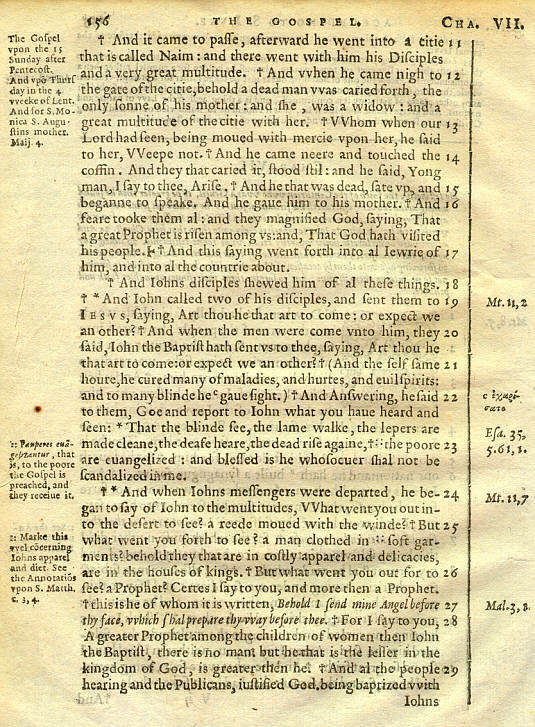 To show exactly where each verse began, a small cross ("") was inserted into the text.